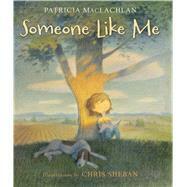 Follow a little girl in acclaimed writer Patricia MacLachlan's semi-autobiographical picture book. Filled with gorgeous and thoughtful illustrations by Chris Sheban, learn what it might take to grow up to become a writer. Patricia MacLachlan is the author of many novels for children, including the Newbery Medal-winning Sarah, Plain and Tall; Baby; Waiting for the Magic; and The Truth of Me. Among her picture books are What You Know First and Lala Salama. This is Patricia's second book for Roaring Brook Press, after The Iridescence of Birds. She lives in western Massachusetts with her husband and her old dog, Emmet. Chris Sheban has been awarded three gold and three silver medals from the Society of Illustrators. Some of the books he has illustrated are I Met a Dinosaur by Jan Wahl, Catching the Moon by Myla Goldberg, and What To Do With a Box by Jane Yolen. This is his first book with Roaring Brook Press.